Report of Fallen on Vantanor IV, 2 x Fallen with Psychic powers masquerading as Librarians. 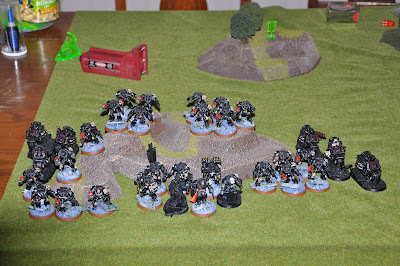 Elements of 1st and 2nd Company lead by Capt Belial and Interrogator-Chaplain Boreas. The must be captured and force to repent at all costs! Belial Comd Squad with 5 x TH/SS with Cyclone, Standard and Apothocary (nasty unit, 3 attacks each and rerolling to hit plus Belials 5 lightning claw and the Chappies 4 Power weapon attacks, ouch!) ***Note: We used rules for TH/SS as they appear in Codex DA to ensure no one felt they were getting an advantage/disadvantage. Librairian - Nullzone, Vortex of Doom! 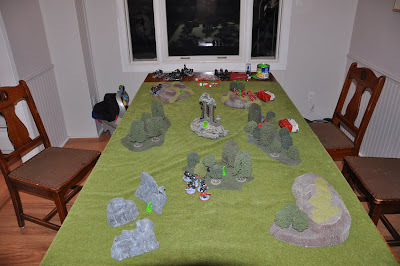 We rolled Seize Ground (5 Objectives) and Dawn of War. 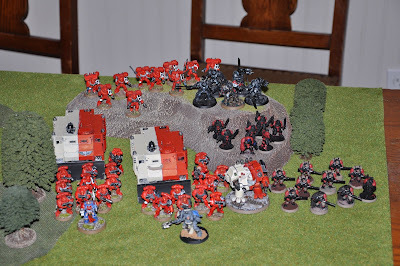 JO chose to deploy first and I started with 2 Termy squads on the table. Apparently Scout no longer means that you can be deployed no matter the game. This is what the set up looked like. We both focused on the one side of the board, as you can see, and I didn't manage to seize the initiative. 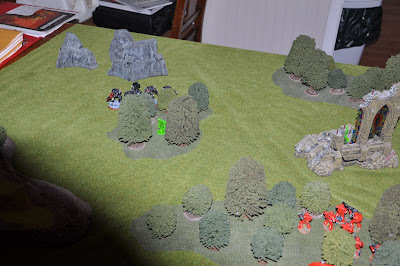 JO - Nothing to report Night fighting stopped him from seeing my Termies, that and that my guys are all black, good thing. BW - Belial, Boreas and HQ Squad teleport in running to avoid standing directly in front of Lascannon and Plasmaguns. 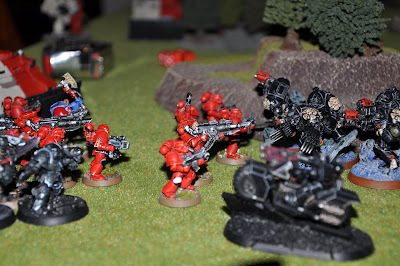 Squad Achilles kills several Marines with Assault Cannon and Stormbolter fire. JO - Scouts with Sniper Rifles and other Fallen (read Librarian) come on. One Fallen uses Null Zone to force me reroll successful invul saves. 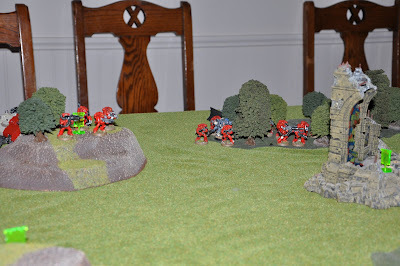 The other uses gate of infinity to move his squad in front of my HQ Squad. Everyone rapid fires and not a single Dark Angel falls!!! BW - The Ravenwing and another squad of Termies arrive, the final squad suffers a teleport accident, due to scattering off the table edge, and luckily they are only delayed. The newly arrived squad lead by a Fallen are hit again my Squad Achilles while the Comd Squad charges both tactical squads. 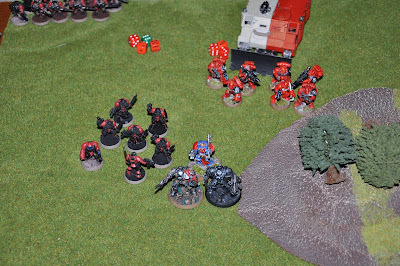 Both my characters end up being punked by PF but kill a boat load of Marines in the process and one of the Fallen. In the end I have 3 TH/SS termies left but have won the combat. However, both squads pass their morale checks and stay in the fight. ****Note: Does anyone know if when you instant kill a Character does it count as 1 Wound or the number of Wounds the character had left for combat resolution? 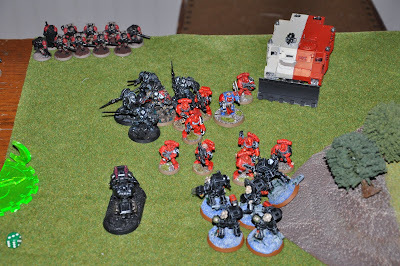 JO - Grey Knight Termies and Assaut squad arrive via deep strike, with the Dreadnought walking onto the board. 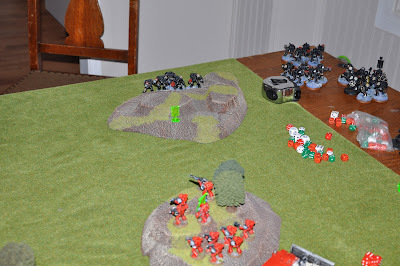 The Termies reinforce the massive combat on the far left while the Assault Squads moves to attack the rear of the Dark Angels. Shooting brings down 2 bikes from one combat squad. While the other Fallen joins the fight and wipe out the HQ squad. 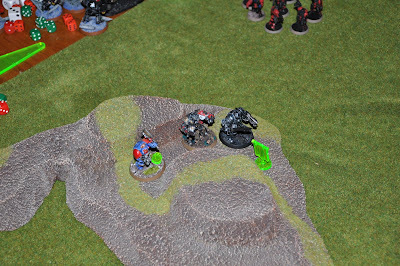 Shooting from the Assault squad takes down one of the termies and the Vet Sgt's Plasma Pistol over heats killing him! 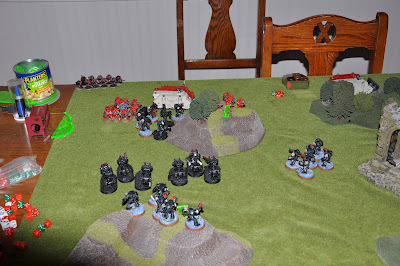 BW - The final Termy squad enters play using the teleport homer, while both Ravenwing and Deathwing elements move to eliminate the Assault squad. 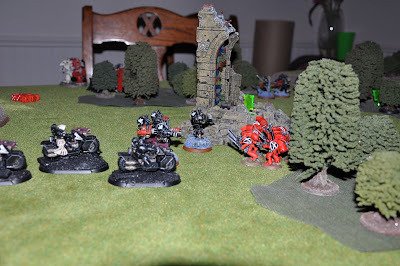 The lone biker attacks the tactical squad in an attempt to delay a charge from the Grey Knights. ***Note: This totally didn't work and I lost a biker for nothing, ooops. 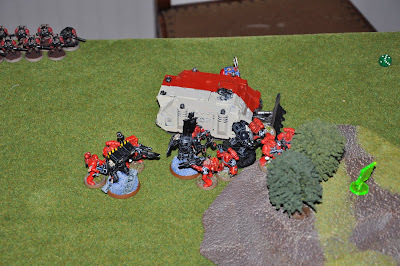 The Ravenwing and Deathwing hit the Assault squad killing them to a man, they then move in behind the ruined temple to gain cover against the advancing dreadnought. JO - The GK charge the Termies and end up killing them all, the Deathwing fight hard killing 3 of the GK before being wiped out. The GK with the now attached Fallen advance on Squad Achilles and shooting begins to take its toll on the squad reducing them to 3 members. 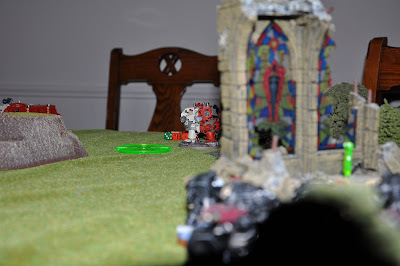 The Dreadnought advances ensuring no assault cannons can draw a line of sight to him. 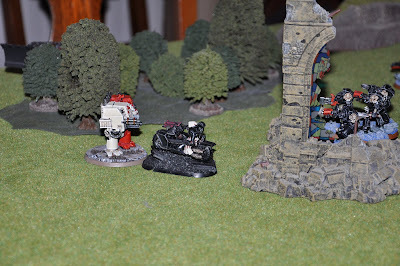 BW - The Ravenwing with a meltagun sally forth to try and take out the dreadnought, but are uneffective. Squad Achilles continues shooting into the GK and Fallen but to no avail. I currently hold 3 Objectives to none but that is about to change. 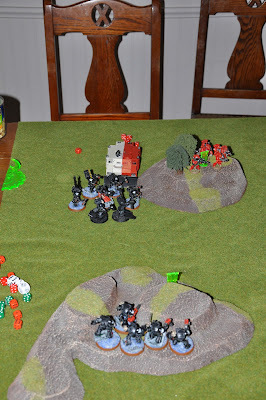 JO - The GK and Fallen charge Squad Achilles killing the remaining Deathwing holding the Objective. The Dreadnought charges the bikes killing one and getting stunned for his troubles. 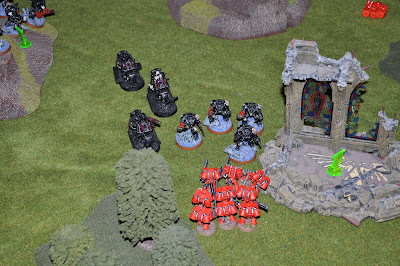 The Tactical Squads move onto the hill capturing another objective. JO holds one and I still hold two. BW - I have very little left to move at this point so both remaining units of Termies move into cover around their respective objectives to give them more survivability against the coming heavy weapons fire. The biker and Dreadnought continue to fight this time doing nothing to each other. At the end of the turn JO rolled to see if the game would continue and rolled a 1. Game over. Talk about a hard fought game! 1 x Fallen recovered. 2nd Fallen fled and escaped capture, contining to search. 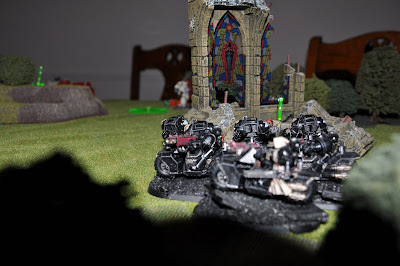 Capt Belial and Interrogator-Chaplain Boreas both wounded, expected to make recovery. The combat score is number of wounds inflicted and not saved - hence an instant kill of a character is removing all his remaining wounds and should count - pg39 of rulebook says "(including all the wounds lost by models that have suffered instant death)"